Global Vision | Visistem, grafična tehnologija in računalniški sistemi d.o.o. Global Vision is the world leader in the design and delivery of Innovative Proofreading Technologies. Their solutions are widely interoperable and have been integrated into the packaging workflows of leading consumer packaged goods companies, printing firms and over 72% of the major pharmaceutical industry worldwide. DocuProof is the world leading proofreading solution for text verification, document inspection and document comparison. DocuProof compares text in virtually any language. 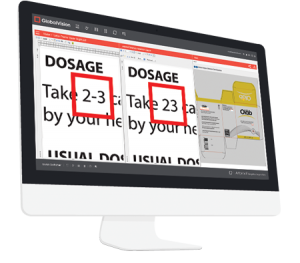 DocuProof quickly and easily finds changes in fonts, sizes, deletions, inserts, spelling, and location, it even compares unlike files (graphic vs. word files). DocuProof dramatically eases the challenges that professionals face on a daily basis when trying to manage and ensure the accuracy of packaging components, contracts, publications, and manuscripts. ArtProof is the world’s first 64-bit artwork inspection solution for Mac and Windows environments. Developed for printer, pre-press and graphics industry users, ArtProof inspects artwork with pixel precision, dramatically increasing packaging accuracy while reducing inspection times. 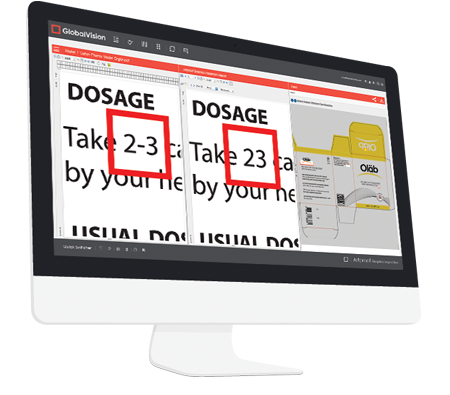 ArtProof quickly detects and identifies missing text, graphics, incorrect fonts and text sizes, as well as broken type and color deviations. ScanProof is an innovative print inspection solution that provides accurate quality control of all printed packaging and scanned components. ScanProof is ideal for the inspection of packaging proofs, labels, cartons and nested press sheets in both printed and PDF formats. BarProof is a barcode verification tool that builds quality into your process by taking it all the way upstream to your PDF files. BarProof automatically locates and verifies all barcodes on a label, carton or press sheet and grades each according to CEN/ANSI/ISO standards. Bar width reduction (BWR) and magnification measurements are also provided. BarProof verifies and decodes 1D and 2D barcodes including UPC, Data Matrix and QR. The BarProof barcode verification module is available as an option with ArtProof, and ScanProof. BrailleProof is a Braille inspection and Braille verification tool that digitally inspects Braille text for added or missing Braille components, to ensure that the Braille matches the approved PDF. BrailleProof also converts Braille components into readable text, ensuring accuracy of the Braille. BrailleProof is designed to meet all Braille standards for pharmaceutical Braille packaging, including the Marburg Medium. With BrailleProof, you can be rest assured that all Braille is accurate, readable and meets international standards, while eliminating manual checking, and reducing inspection times. Scan360 is the leading artwork inspection scanner for cylinders. Designed for the consumer packaged goods (CPG) and pharmaceutical markets, Scan360 will directly scan the surface of any cylindrical item and automatically compare it to the approved proof. BraillePoint is a Braille dot measurement tool perfect for measuring Braille dot height and verifying Braille dot placement. With BraillePoint, users can ensure the precision of all embossed and screen printed Braille found on cartons and labels. BraillePoint uses advanced electronic measurement technologies to measure Braille dot height directly. Unlike scanner and camera based measurement systems that are dependent on dot shadows and complex algorithms, BraillePoint is capable of providing the most accurate results. With BraillePoint, you can be rest assured that all Braille is accurate, readable and meets international standards, while eliminating manual checking, and reducing inspection times. Braille presence module the ability to compare Braille dots from a BraillePoint scan to a Braille presence template. the workflow process, and identify previously undetected errors before going to print. iCount is the leading insert counting tool. Designed for printers and packaging professionals. iCount is designed to accurately count inserts, outserts and cartons in as fast as 1/30th of a second.